On the other hand the Spanish position makes sense. If the final settlement sees a customs union but no free movement of people and services, it is kind of pointless for Gibraltar and the Spanish communities around it. Surely the reality of what the U.K. has done to itself must be getting crystal clear today with the Gibraltar situation. Not only is it karmic payback but also an indication of a grossly weakened position in international affairs, especially with Europe. The UK’s fortunes will remain inextricably linked to those of the EU but where it once had as much sway as the big boys it will now be trading punches and losing routinely against second tier powers like Spain and Italy and the NLs. Hell, even third tier powers by virtue of aligning the EU against the U.K. will have the power to extract concessions from the UK in the future. Whatever semblance of power and influence the U.K. once had standing shoulder to shoulder with all of Europe is gone forever. My country has made countless blunders in be past, but I submit Brexit as the most incredible act of self harm by any Western nation since WW II. It’s very hard to believe this is really going to happen. The irish border and Gibraltar are indeed prime examples for how intra-EU solidary really matters where it counts, with no malice, but also without mercy towards a third country trying to subvert common european interests. The leaders of the EU27 has agreed to the divorce document, now on to the next step. DUP leader Arlene Foster says the choice over Brexit is "not between this deal and no deal" and warned the only option is "to look beyond this current draft withdrawal agreement and work in the time ahead for an improved outcome"
Can somebody please wake her up? I doubt we’ll get it through parliament. We'll see. It has to pass at least 28 parliaments. There is no real alternative. The alternative is no deal or no Brexit. Both seem unacceptable: you are telling us that a re-vote is unacceptable and without it, I doubt that there will be no Brexit. No deal will have the same problems passing through UK parliament, so I doubt that is a real possibility. So that leaves this deal. Let's face it, the UK wanted a 'divorce' from the EU for weak and selfish reasons, wants a 'cafeteria' deal where they pick and choose the conditions while the EU is in the power position to state the conditions of a full 'divorce'. Throw in the not considered issues of NI and Rep. of Ireland when people voted for it and now Gibraltar a nasty sticking point and this looks like a nasty divorce of a very rich couple. I agree that the Parliament will make a bigger mess of things, with minor parties looking for deals to vote in favor of it and likely a deal no one will like. Unlike some Royal countries, the Crown has no say or veto power in this situation although the Head of State. One has to wonder if they did what they would do. Meanwhile the Pound drops in value to the Euro and USD, more jobs are disappearing to the mainland EU instead of staying, Millions are angry and have their lives messed up. Sounds like the country needs a special bank holiday to consider it positions and to get feedback from their voters. I suspect in the end that some half-assed deal will be done, and a lot of politicans will be voted out in the next election, likely next Spring. after the doomsday date. The Withdrawal Agreement actually needs only a majority vote in the Council and the consent of the European Parliament. A deal on a new relationship, however, will have to take the scenic route through all national and some regional parliaments! Today on Marr, Arlene Foster looked a lot as if she was setting out her stall to be bribed for her consent, puffing up her dubious "principles" just for eventually, "grudgingly" conceding once the bribe looked big enough to her such as, say, yet another billion...! I suspect in the end that some half-assed deal will be done, and a lot of politicans will be voted out in the next election, likely next Spring. after the doomsday date. At most there might be some minor protocols and clarifications tacked on to today's deal, but nothing more. Labour are lying or delusional in pretending that they could actually have any substantial renegotiations. The EU27 just won't do that. UK politics have been focused on the relationship with the EU for years, and it seems it will continue for a long time still. I guess people don't really need a government to do anything else, in the UK. In France some politicians would have lost their heads by now, if something similar was going on. I think the WA would make it through UK parliament rather easily, if Labour MPs were not smelling the opportunity to bring the Tory government down. So why not take that option of the table and schedule fresh elections right after the WA vote? Then at least MPs would (hopefully) vote for what is in the best interest of the UK, rather than their own seat/party. True, would be the best for the country. Party politics should be left behind by now. I could see many people saying that since an election is coming, it should be the newly elected MPs that vote. It would be more democratic, too, taking decisions while walking through the door is not exactly great. Are you trying to imply the legally constituted parliament of the UK is illegitimate? No I'm not trying to imply anything. If new elections are called, when there is no constitutional obligation to do it, then it's precisely because the government feels illegitimate, or at least in need of new legitimation. I always liked the Danish? (I think) method of constitutional changes. A parliament passes a constitutional amendment, then a new election is called that needs to pass it again, and then in the end it's passed on to the public for a referendum. Major changes such as this one need a more robust system of checks and balances. Really? Because it seems like both issues are bilateral, not multilateral, and are being used as wedge issues despite their relative unimportance. I'll give it to the EU though, they were clever enough to cynically turn Northern Ireland into a key negotiating point and the British Government was too weak to stand up to the bullying. As for Gibraltar, I assume that the Spanish are in the process of transferring sovereignty of their Moroccan enclaves to the Moroccan government? Or at the very least opening up talks on joint sovereignty? No? Well then, time for Pedro to pipe down. A solution can always be found, so long as you're looking for one. When you just want to bully and humiliate the United Kingdom for daring to leave the glorious EU "project", then no, there won't be a solution. The biggest threat to the EU, aside from the general financial ineptitude across the bloc, is the prospect of Britain making a success out of Brexit and other countries realizing that they don't need a Federal Union to succeed either. Quelle Horreur! Well it wont be forgotten. I (and hopefully many others in the UK) will stop buying EU goods. Hit them in the pocket. Good luck with that. The vast majority of your available fresh food is 'EU goods'. The various 'shortages' due to a little bit of crummy weather in Spain last Winter/Spring showed just how reliant the UK is on 'EU goods'. The items couldn't be easily be sourced from elsewhere nor cheaply. Don't be so touchy. You wanted to leave, so first your responsibility to resolve it. How much was it? 500 pounds/month/household damage or so? Really? Because it seems like both issues are bilateral, not multilateral, and are being used as wedge issues despite their relative unimportance. Everything that effects the consistency of the single market makes it an EU matter. Both hose places would need a hard border outside of a pretty close relationship with the EU and that us not going to happen. They are rather important little details, not two unimportant issues. Voting for that deal is treason imho. Only the British press is talking about sovereignty. What Spain is talking about is a veto on Gibraltar conditions of access into any future EU-UK agreement. Much like Spain had to concede back in the day that Gibraltar was to be treated as part of the UK family (using PM May words) despite its sui generis tax situation, now Spain will try to force that if Gibraltar wants to use the same deal as the UK will get, they will have to abide by the same rules as everyone else. If British citizens are ok with Gibraltar leeching off the UK economy that's their prerogative and by all means go on. Spain has a right to object to those practices being used against them. December 11th will be D-day for Brexit. The best way forwards is upwards! Not just within the EU either, Moldova being a case in point hindering our ability to get a Government Procurement Agreement at the WTO. Are you suggesting the UK public has been lied to? The trick is realising that both sides were (and still are) lying. Of course, never let the inconvenient facts get in the way of the virtue signalling remain supporters who'd sell their mothers for a seat in the European Parliament and their own country for a seat on the European Commission or their opposite numbers who believe a US trade deal is the be all and end all. I'll give it to the EU though, they were clever enough to cynically turn Northern Ireland into a key negotiating point and the British Government was too weak to stand up to the bullying. Never mind how sad it all is, at least the entertainment value hasn't gone yet. 1. "We will control our borders". 2. "We will make the Irish border an EU outer border, but we want nobody to control it". The EU proposes a couple of ways to fulfil both demands, and that is "cynical bullying". I wonder how we reached such a level of sillyness. Could it be due to faulty use of one word only? "Divorse" ? Brexit is not a divorse. Divorse is an event where two equal partners end their relationhip and become single. Brexit is a withdrawal. You withdraw membership of your golf club, and then you sign up in another golf club, or you quit playing golf. But big surprise, the old golf club continues mostly unaffected - with one less player on the membership list, one less vote at the AGM, and one less potential candidate for election of club chairman. Some golf clubs accept guest players on the green on certain conditions. How cynical can a golf club be? The lengths people go to avoid difficult elements in this is incredible. "Divorce (English spelling) is an event between two equal partners"? Really? Where do you come from? How disconnected are you? While the people involved may be "equal" in rights granted by the rules established by the state and required judicial respect, more times that not the parties are not equal. And based on that those rights and the court dictates that the "superior" one, the one in the greater position off strength (normally financially) is required to accommodate and assist the other party to ensure that they exit the relationship on some level of "equal" or at least not terribly damaged (again normally financially). And of course in absolutely no way would the EU want that in any way. "Brexit is a withdrawal, like quitting your country club, why are you surprised when the club goes on fine without you"? Really? Is that club your entire community, where you do almost all of your business and where you to shop and spend time etc.? Seriously, this is as "avoidance of the difficult facts that while I fully support individuals not being allowed to create a situation where the weaker partner will be grossly impacted. That is only for individuals. If it is nations with millions of individuals, then go for it, whatever damages them, well that is their fault." Avoid the fact fine, if someone wants to leave a relationship , for whatever reason, that is OK. And if that individual is cast into destitution that is acceptable. The entire problem is that the EU is terrified as whatever is set in place here will be a model if , for any reason, another partner might want to leave, And the message is VERY clear, any partner that leaves this relationship, this club, gives up membership, shall suffer harm (that they brought upon themselves). Period. It is that simple. Don't leave. You can lambaste me all you want, it does not affect me. As I have said many times I find the entire situation sad. I think the UK will survive and be OK but the there will be a price, and quite possibly a high price. And this is a choice they made (however deceptive the path was to that choice). And of course that is completely fair, it is the EU, it is their club, their rules, that was agreed to go by. The only message the EU is sending that you can not have the benefits of the common market without agreeing to the rules, 4 pillars and such. Imho this deal is nothing that the British people voted for. It is neither being in the EU and enjoying all benefits, nor is it being totally independent and being in control. It is the worst of both options and should be rejected. Somebody has to come clear and say that Brexit never was a realistic option and all promises made were lies. And the message is VERY clear, any partner that leaves this relationship, this club, gives up membership, shall suffer harm (that they brought upon themselves). Period. Of course ... each and every deal ever signed by parties voluntarily was a win-win for both sides, or at least both sides where convinced they would make a win. Vexit has to have a cost by definition, the EU doesn't have to send that massage, that is a simple fact of life. If there was nothing to lose from leaving, you would not have joined. In the first place. You can lambaste me all you want, it does not affect me. In a global world I wouldn't be so sure. How many supply lines go across the channel at some point that effect you? And of course that is completely fair, it is the EU, it is their club, their rules, that was agreed to go by. 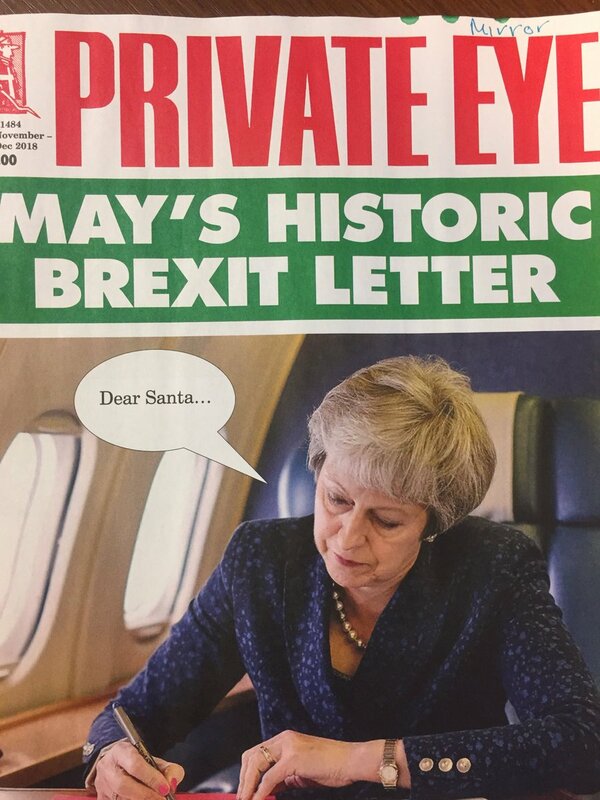 Actually, the same is true for the Withdrawal Ageement: Article 50 by itself throws the exiting country out on the street without any deal – that is so horrible that pretty much any deal is a big win over that, and compared to that the current deal is indeed a huge win for the UK and still a pretty noticeable one for the EU, too. Actually triggering Article 50 was the huge mistake on the UK's part which will do massive damage to the UK, but after that was actually done the deal which has been agreed mitigates much (but still not all) of that damage, so the usual principles still apply to that, at least. The line The EU does not seek to punish Britain, Brexit will be punishment enough is crystal clear. There's no intent to create more harm than necessary, it's the act of leaving that's harmful, and that's entirely self-inflicted. There's a very delicate balance in international relations. The kind of special treatments the UK is asking from the EU, unless balanced by other commitments would cause a number of other actors to think they got a rotten deal. Out is out, for a variety of reasons, and the UK seems to have failed to grasp what it's like to be a medium-sized country in the world of large economic superpowers. Interesting indeed, so the Britts have a way out. The basic point is: "Aidan O’Neill, lawyer for the Scottish politicians told a hearing of a full court of Luxembourg justices who have expedited the case because of its urgency, said all parties agreed that Article 50 could be revoked." The unilateral reverse is just an opinion by Scottish lawyers presented to the ECJ. Not yet - the ECJ has yet to give its ruling. It will be very interesting indeed if this is won, as it would further shift the likelihoods and probabilities between "No deal", renegotiation and remain (I've already discounted Theresa Mays deal), and give a peoples vote option the legal clout it needs to be fully effective. ok, when will the ruling be? this week right? they are using the "expedited procedure" to make a decision quickly, quite how quick this would be I do not know. By 2030, they estimate that gross domestic product per person would be between 1.9 percent and 5.5 percent lower if Mrs May’s deal were passed than if the UK remained in the EU. That is the equivalent of an annual hit to living standards of between £700 and £2,000 per person. If there was no deal, the study found that long-term costs might rise to more than £3,000 each year. Quite expensive for living in an illusion. Yes, but any withdrawal agreement will involve a cost to the UK, its economy and people. This is unavoidable. There is no deal that does not involve a cost. The brexiteers, Labour and various others can harangue TM as much as they want, but there is no getting away from the fact that withdrawing from one of the world's largest markets and going it alone will incur a cost and those who are attacking TM's deal now are convenientally ignoring that reality. This is the reality of what the people voted for. TM got the best deal anyone could have got and cherry picking bits here and there and objecting to the backstop is not going to achieve anything - there will be no hard border on the island of Ireland and even if there is, the cost of building and maintaining that will fall to the UK (and it won't be a small cost). We're getting a lot of emotive claptrap; I was listening to a guy on Irish radio this morning, an "expert" from the LSE (the London School of Economics) who was a brexiteer and it amazed me that he was coming out of some of the stuff he did. There was a lot of smoke and flag waving, but very little of real substance. It really is scary.